Last edited by Overflow on 25-May-2016 at 08:43 PM. wow does that mean it now has a fpu in the core? Apprears so. I would think a Developer/Betatester wouldnt post that picture unless its someting they feel comfortable with capabilitywise. Maybe we will see good Quake performance for example. Cosmos's Quake tweaks require FPU, so right now its crawling on Vampire. This will hopefully fix that. Last edited by Overflow on 25-May-2016 at 09:38 PM. The developers of this Vampire project are truely amazing keep up the good work. Just a shame they are made by hand be great if we could get them produced in larger numbers in china or some where. Cant wait for A1200 version hope its not to far down the road. by g01df1sh on 25-May-2016 17:18:01 @Overflow The developers of this Vampire project are truely amazing keep up the good work. Just a shame they are made by hand be great if we could get them produced in larger numbers in china or some where. Cant wait for A1200 version hope its not to far down the road. well this is amazing news as I've got no need for an accelerator with no FPU, I'll be pre-ordering the 1200 version when available! 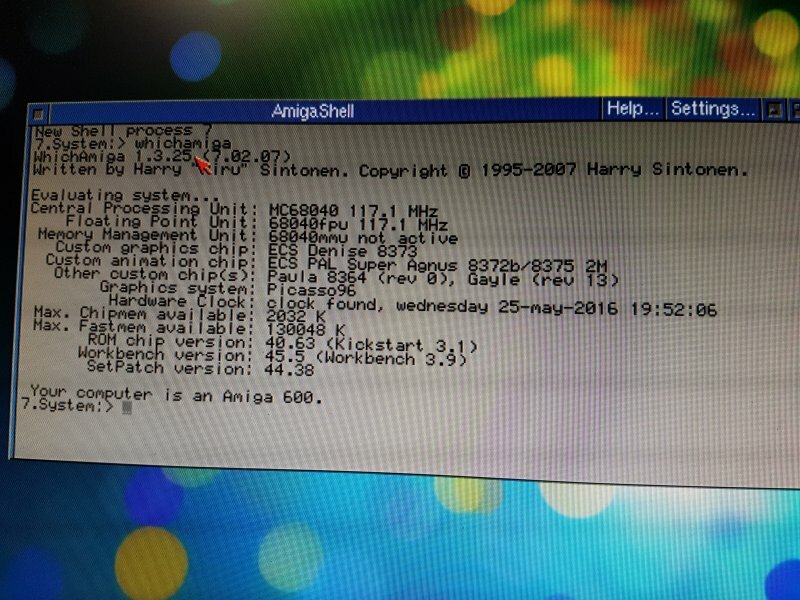 This is definitely the hottest Amiga project running!!! actually it should already be considered a series of projects. Last edited by wawa on 26-May-2016 at 02:01 AM. Does anybody know, if this technology will be used by Individual Computer's Amiga Reloaded? Last edited by Birbo on 26-May-2016 at 11:32 AM. thats completely different projects. different people. apparently some disagreements. so i bet, the answer is: no. It shouldn't be necessary. A stand-alone motherboard with a full Apollo core should be available at about the same time Jens comes out with his. I think this is a shame. Our community is so small and many times developers are not able to work together because some disagreements. To me it would make absolutely sense if Individual Computers and the Apollo Team work together for 1 great Amiga Reloaded Project. Already the Natami Project died because of some strange Ego behaviour. We don't need to fight one against each other. We are not enough. Last edited by Birbo on 26-May-2016 at 06:42 PM. Hopefully it's [made and] priced like a Raspberry Pi 3! Last edited by Lou on 26-May-2016 at 06:49 PM. I think this is a shame. Our community is so small and many times developers are not able to work together because some disagreements. To me it would make absolutely sense if Individual Computers and the Apollo Team work together for 1 great Amiga Reloaded Project. Already the Natami Project died because of some strange Ego behaviour. We don't need to fight one against each other. We are not enough. jens harshly criticized the project as well as majstas hardware attempts, issued a number of accusations it was some different cpu under the hood and refuses to accept its compatibility with 68k except proven otherwise, but on his own particular terms. i remember he was openly invited by gunnar to come arond for a beer, check first hand and maybe even talk some business. it seems something happened and fronts have hardened. i dont think though its apollo team's fault. its not a strange ego behavoiur. its simply different goals. natami is a private project gunnar and others joined in with the intention to introduce cpu fpga core. it hasnt worked out, because it was too complicated imho. natami was meant as an amiga replacement with added features. it was simply too ambitious to be achieved in one step. today apollo core is succesful because buliding accelerators for existing machines is simpler as all in one stand alone system. and natami is still being worked on and ocassionally showcased. it isnt dead. Last edited by wawa on 26-May-2016 at 08:36 PM. Last I heard was that we should expect a good 4 weeks before they have ironed out all the bugs, and added the missing instructions. No... too many hands in the kitchen, and nothing gets done. The projects are unrelated. If Jens wants to ensure compatibility with the Vampire and his Reloaded project that would be ideal. If he somehow breaks compatibility then his sales will suffer. Apollo Team should make the standalone FPGA board Mini-ITX I think. Make a 1200 case compatible version secondary. Jens of Individual Computers has invested quite a bit of money into several of his projects, most have made a profit, some have not. I might not agree with the reaction or attitude of Jens toward some other project creators/programmers, I do understand his position as a business man trying to make a profit in a very difficult niche market, specially when some of his projects take years to complete, and other projects over-lap the portion of the market he is trying to fulfill, which could hurt his sales, when his project(s) is/are finally ready to release and sell to the public. I don't think Jen's ego is any better or worse than most other Amiga developers of software and/or hardware projects. All developers can be difficult sometimes, just like the rest of us. The market is so small, that companies working on similar products have to fight to survive. It's a genuine problem with the companies, not the reality of the market. In limited markets, it's critical for small companies to cooperate to form standards and share resources to avoid duplication of effort and fragmentation. The resulting products can then compete. The Amiga has always been cursed by this "not invented here" syndrome. Somehow it's always made more sense for developers to rewrite code and sue one another than to work together for mutual benefit.